Are they toilets or are they artworks? 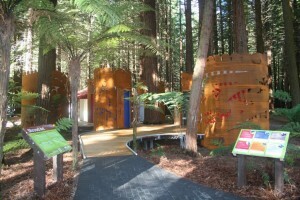 The natural random layout of the toilet structures replicates the scattered nature of the trees surrounding the site and the cylindrical nature of the shrouds themselves replicates the sturdy trunks of the trees. Joined by a flowing boardwalk, the toilet concept is functional and fun. The design is respectful to the environment yet reflects the fact that The Redwoods is a significant visitor attraction. The shroud designs use cut corten steel, fusing the traditional Maori kowhaiwhai pattern with imagery of birds. The designs focus on the fragility of New Zealand’s native bird species. They serve as a reminder to be careful when we go about our everyday activities as our actions affect the environment its flora and fauna.